Orchids | The diva of flowers. 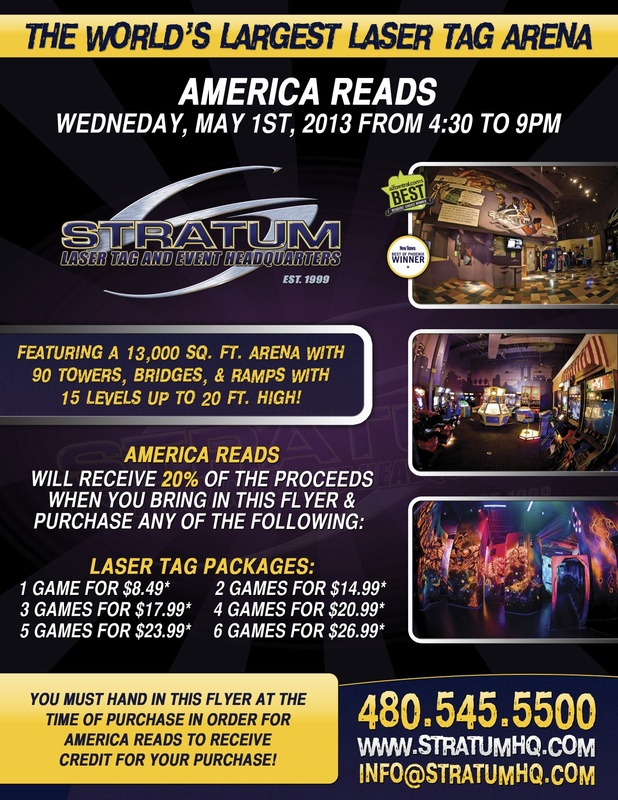 Stratum Laser Tag, the world’s largest laser tag arena located less than 10 miles from ASU, will generously donate 20 percent of laser tag purchases when you bring in this flyer! Proceeds will purchase books for Title 1 students in our after school tutoring program to assure access to one reading book during the summer break. We encourage America Reads tutors and staff to represent your site in a friendly site war competition, more details to come. Nabil Merza is an amazing artist who is 100% self-taught. Hear his story and see his work now. But, a greenhouse for your orchid can literally cost a fortune and take a ton of maintenance. For example, a Phoenix Greenhouse from Charley’s Greenhouse & Garden can range from $8,000 to $15,000! I am going to show you 11-steps to an inexpensive yet, effective way to give your orchid the environment it needs to live a long and happy life! Especially in desert climate like Arizona! The milk jug will be used to house the orchid. First, we need to cut out a window on the opposite side of the handle on the milk jug. Do this by using the marker to draw a big rectangle as shown below. Now, cut out the rectangle. To cut with ease, try poking a hole with the scissors first and working your way around. The cut out can be disposed of when done. The lava rocks will be used next. 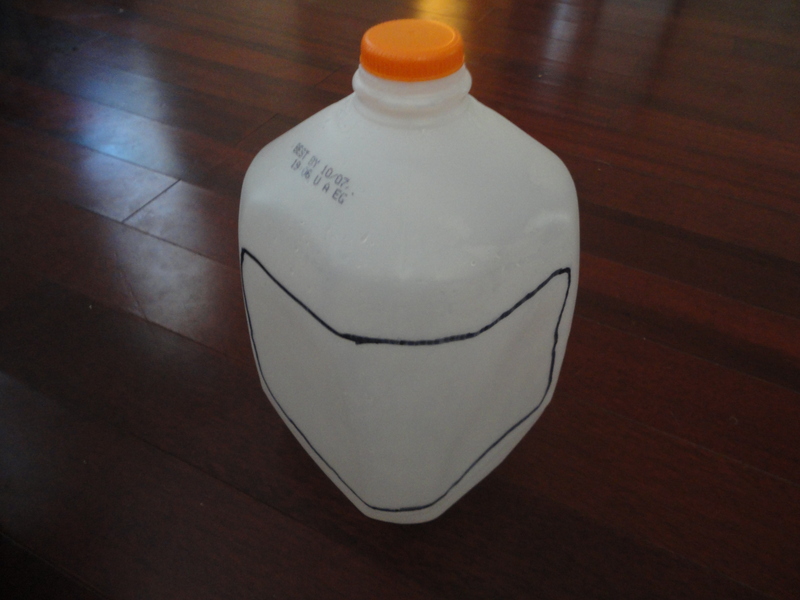 Simply place a single-even layer on the bottom of the milk jug. 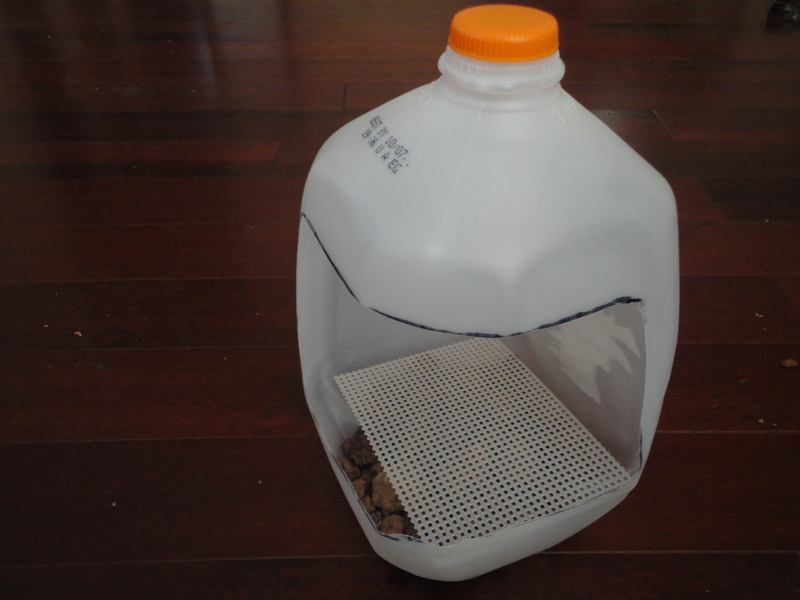 This is used because the surface area between the holes will produce the most evaporation. 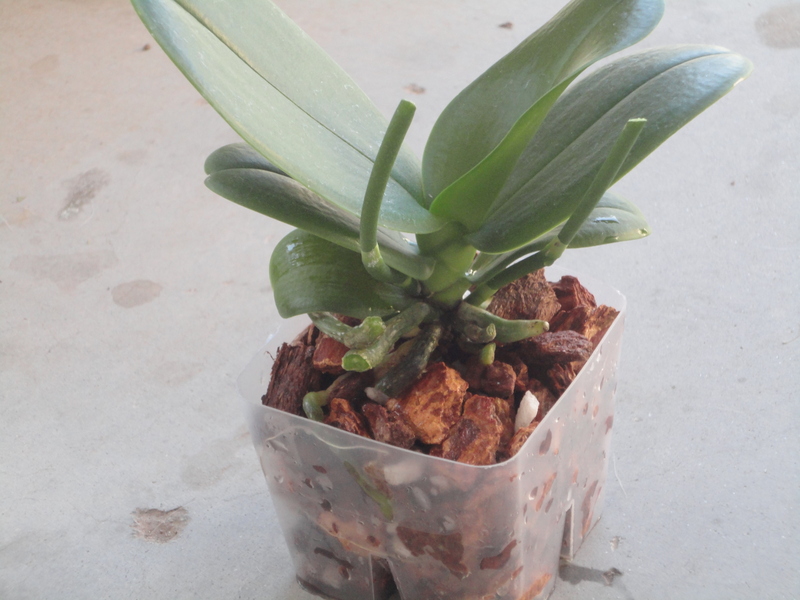 In order to put our orchid inside the greenhouse, we need to repot it into the small, square plastic pot. This is the messiest part of the process so I recommend completing this step outside. Also, even though the orchid might seem fragile, it can really take a lot so don’t hesitate to ruffle up the plant in this next step. 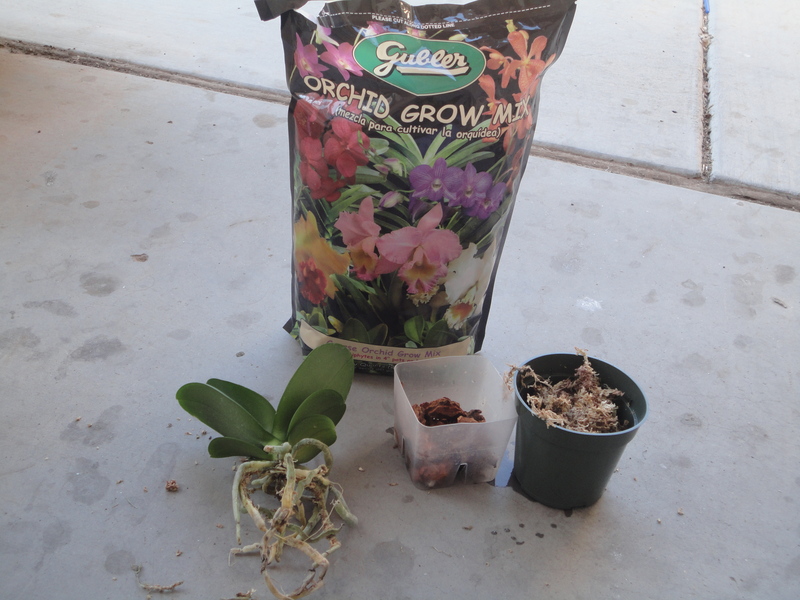 We will need our Orchid Grow Mix, small plastic pot, scissors and the orchid. The first thing you need to do is grab the orchid out of the plant. I do this by holding it upside down and yanking it out. Now, there is a ton of either moss or dirt surrounding the orchid. We need to take all the moss or dirt off. Do this by pulling the material away from the roots. 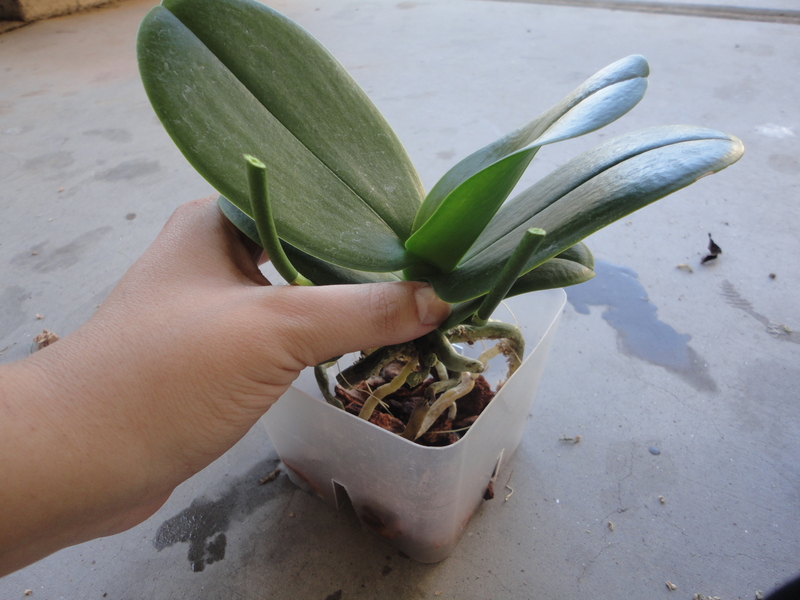 When you are done, your orchid should look naked with only roots and plant showing. Before moving to the next step, be sure you cut off any dead roots that are dry and white and you trim any live roots that are longer than six inches. Six inches is the perfect length for an orchid root. 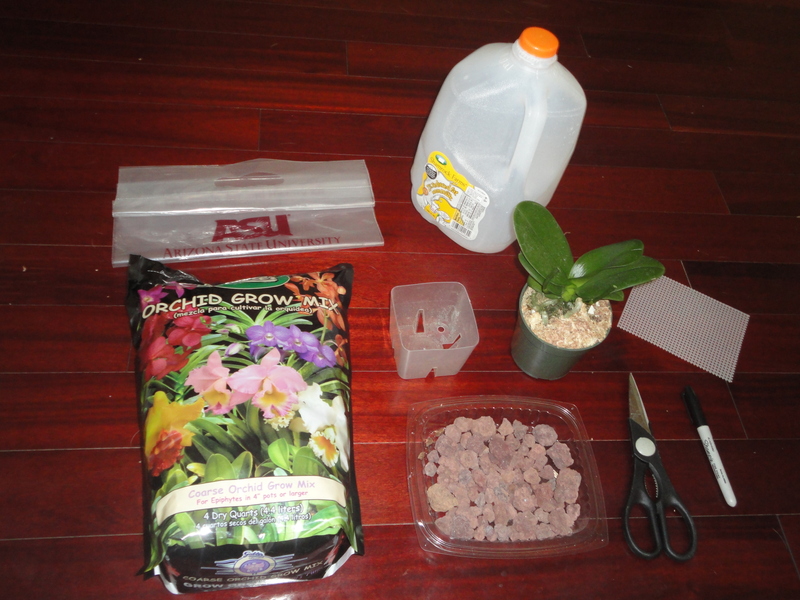 Now, cut the Orchid Mix bag and put a single layer (less than an inch) of the mix into the small, plastic pot. The Orchid Grow Mix I use needs to be pre-moistened. If yours does too, then be sure to run water through the mix before potting. Next, use your thumb and index finger to hold the orchid over the small plastic pot. 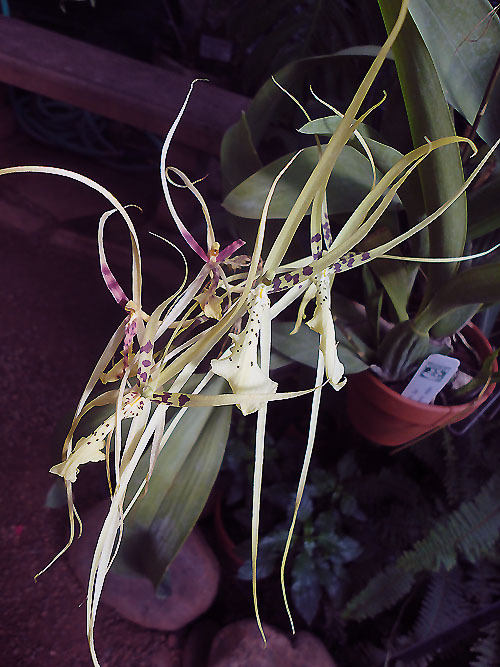 The roots that are a light green or yellow should be placed deep in the pot, while dark green roots that are short and toward the top can hang over the Orchid Grow Mix. Use your free hand to grab a handful of the Orchid Grow Mix (pre-moistened) and start filling the pot. Use your thumbs to press down on the mix to fit more inside. The mix should be filled to the top. Now, your orchid is repotted and fertilized! 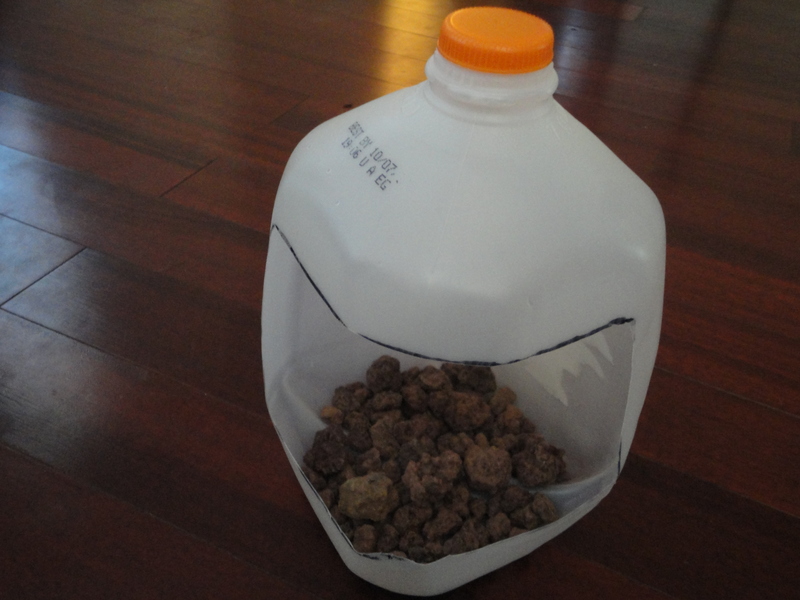 Next, we need to put water into the milk jug underneath the lava rocks. The lava rocks will indicate how much water is needed. The water should never actually touch the orchid roots so we need there to be just enough water to cover the lava rocks half way. Now, we need to place our plastic divider (preferably with holes) on top of the lava rocks. This will serve as a barrier between the water and the pot and will create an even surface for the orchid to be placed on. 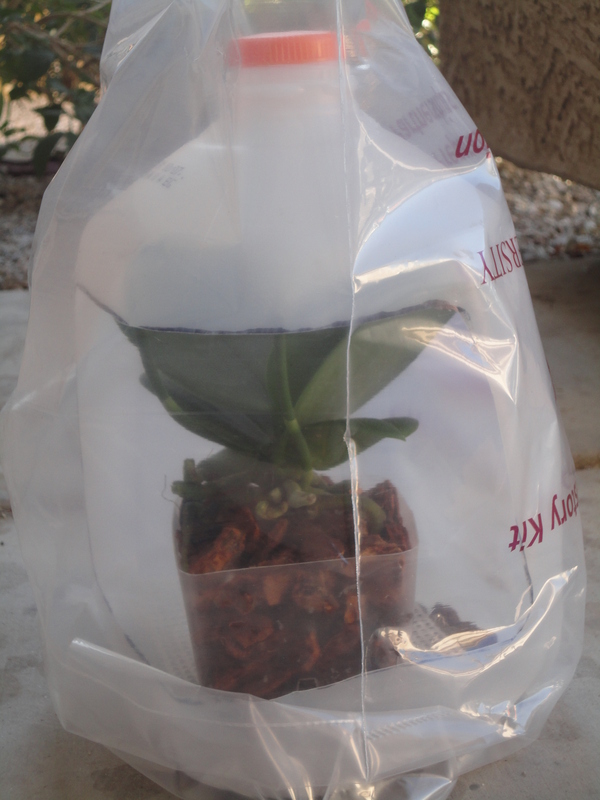 It’s time to place the newly potted orchid inside, simply place the orchid inside the jug on top of the plastic divider. There is just one last step to complete your greenhouse! 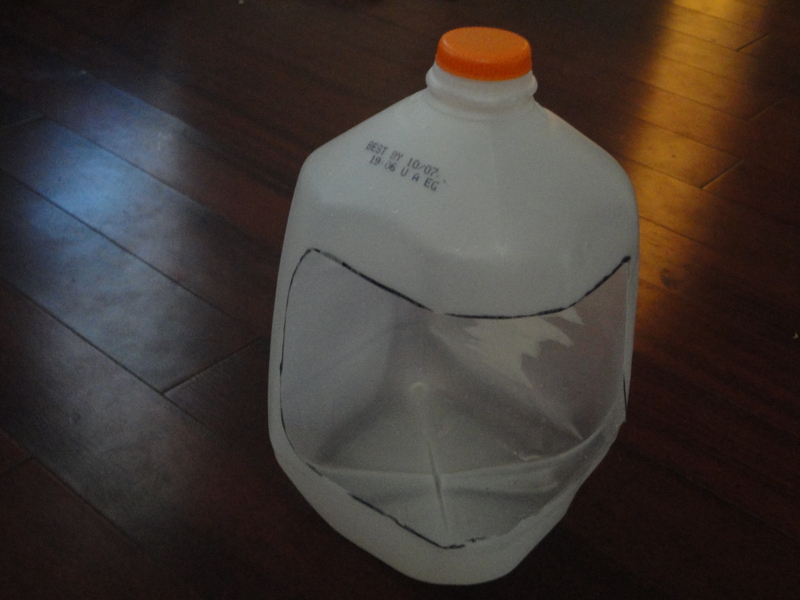 Take the plastic bag and place it over the milk jug as shown below. You now have your very own homemade, inexpensive mini-greenhouse! Your orchid will love its new habitat because the temperature and the humidity inside the jug are perfect for the orchid to flourish for years to come! Do not leave the greenhouse outside. I made this mistake and a storm came and blew my greenhouse away. 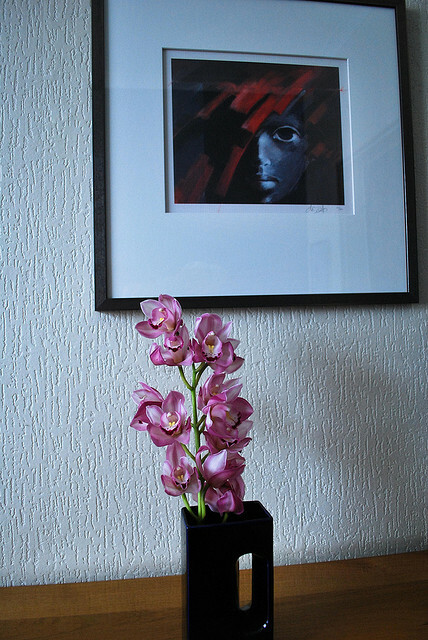 The orchid still needs to be watered one to two times a week. Just take the orchid out of the jug, water it and then put it back in the greenhouse. The orchid will need to be re-potted when it outgrows the container. Most orchids do not like direct sunlight so find a balanced spot for your greenhouse. Want a chance to attend an orchid show for free? Are you interested in buying the perfect orchid to grow at home? Then be sure to attend A Mountain of Orchids! A Mountain of Orchids is an annual Orchid Show and Sale Presented by the Orchid Society of Arizona! There will be “orchids, supplies cultural information, refreshments, gifts, and raffles. When: Saturday, October 15th from 9 AM to 5 PM and Sunday, October 16th from 9 AM to 3 PM. For more information: Contact Lou Ann Remeikis, Show Co-Chair at (602) 803-6889 or visit the Orchid Society of Arizona website at www.orchidsocietyaz.org. Where: Tucson Botanical Gardens in Tucson, Arizona. 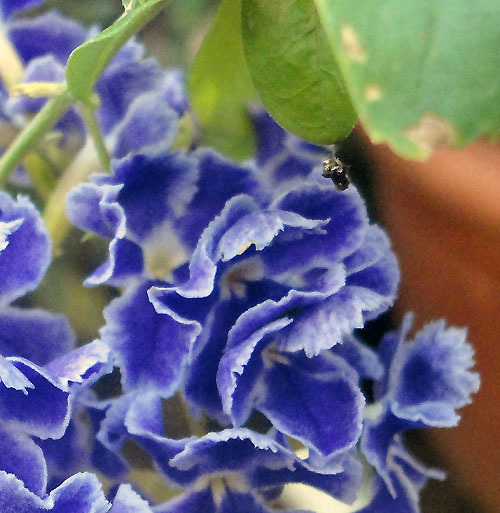 Why: Orchid lovers, flower fans and anyone interested can witness the exotic wonder of orchids. More information: General admission is $8 for adults and $4 for children. The Tucson Botanical Gardens is open 8:30 a.m. – 4:30 p.m. Things to do nearby: While you are checking out the exhibit, try wine tasting locally at CataVinos Wines! Sample six specialty wines that follow a new theme each week, with cheese and other gourmet goodies for only $10. Emily Rockey is very passionate and talented in the plant world. 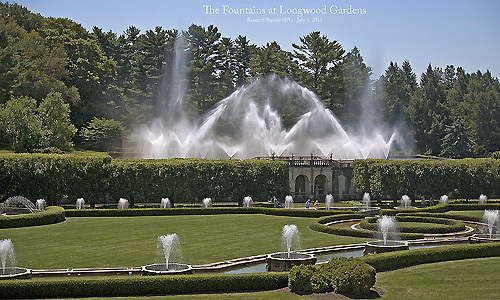 She has had the opportunity to work at Longwood Gardens in Kennett Square, PA. The collection in Pennsylvania fascinated Emily and helped her grow an “enormous appreciation” for orchids. “They are fascinating, sometimes it seems to me that they have something like a personality,” said Emily Rockey. She currently is in charge of the greenhouse, and she curates all the other plants in the Tucson Botanical Gardens Collection. Emily also belongs to the Tucson Orchid Society. Nora Merza: How did the very first “Mad About Orchids” exhibit go? Emily Rockey: The exhibit was a great success; we got a lot of good feedback on it. Orchids are not typically featured at gardens in our desert environment, which made it something new and special, I think. The three beginner educational courses on orchids were extremely popular; we will be offering it again this fall. Nora Merza: What made you give orchids their own event? Emily Rockey: I didn’t actually decide on the exhibit, and oddly nor did horticulture department here at the gardens. The executive director and planning committee made the choice. But I’m glad they did, and I bet we will see it again in the future. 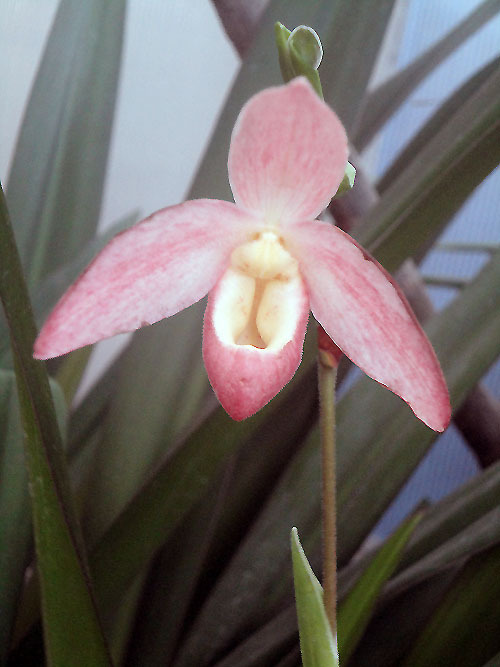 Nora Merza: What have you noticed that interest people the most about orchids? Emily Rockey: People seemed to “exclaim” the most about the diverse shapes and colors of the blooms. They look so exotic. They also many grow epiphytically, perched on something (like our “tree” in the exhibit), which is different. Nora Merza: Do you think “Orchidelirium” is just a fad, or here to stay? Emily Rockey: It is definitely here to stay, and will only become more popular if anything. Only in recent years have beginner orchids been so available in super markets and grocery stores. They are no longer a “specialty plant.” The term “Orchidelirium” refers to a period in the mid-19th century where people began to grow and be amazed by orchids. They were new and different at that time. We have learned so much about care and culture, and hybridization alone is an enormous business. Nora Merza: Which orchid at the Mad About Orchids event is your favorite? Emily Rockey: I have a weird favorite. It is actually a mutant plant, which is referred to as peloric. This is a Doritaenopsis, a moth orchid hybrid, a cross with a Phaleanopsis and a Doritis. This particular peloric plant has 3 lips instead of one. Look closely and you can see which one is the “proper” lip. I have applied a special hormone to try to vegetatively reproduce this plant, or get it to grow a little clone plant on it, because collecting seed from it would most likely not produce a plant with the same mutation. Coming soon: A video of the ‘Mad About Orchids’ exhibit and the complete interview with Orchid Curator, Emily Rockey! I used the rule of thirds here. Orchid in a giant mug pot. 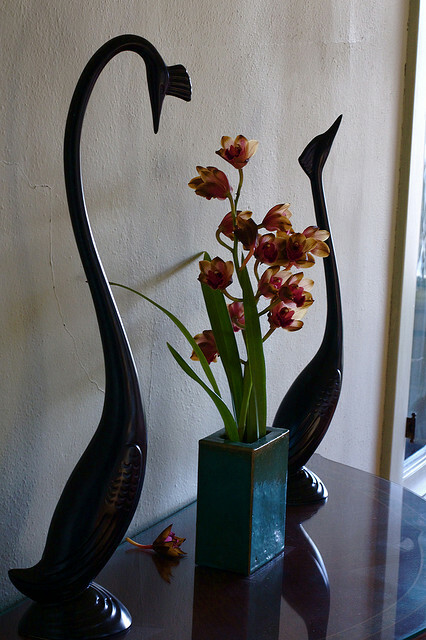 If you want to think like an interior designer you need to think orchids. Orchids are fashionable, trendy and they guarantee a smile with every notice. The professional’s secret is to place the orchid in a fashionable pot. Try placing a pot of orchids in a giant mug and add some glamour to your kitchen sink! And the thing that I love most is that both men and women can use orchids to twist perception to accommodate whatever mood or setting you want to exist. And I agree! I take my boyfriend to look at orchids all the time. 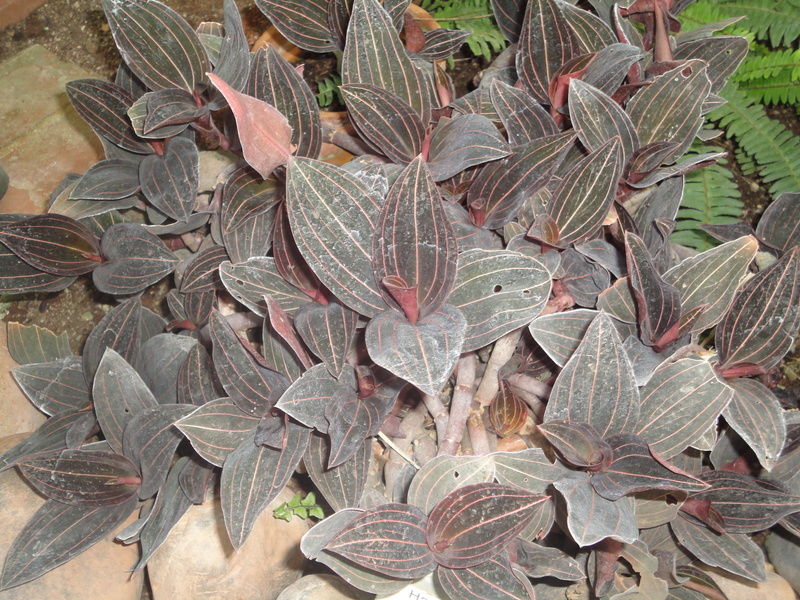 The type of orchids that men can decorate with are these unique masculine breeds like the Jewel Orchid. If you live in a dorm, an apartment or any bedroom that you change frequently, I recommend going to the store and finding your decoration vision from an orchid. There are literally thousands of orchid style, colors, designs, patterns and textures that I promise you will find one that speaks to your soul and imagination! For example, if you need to decorate a room you can visit your local grocery or home improvement store and snag some inspiration. Use Chinese light fixtures, and you’re done! Do you have any more decorating ideas with orchids? 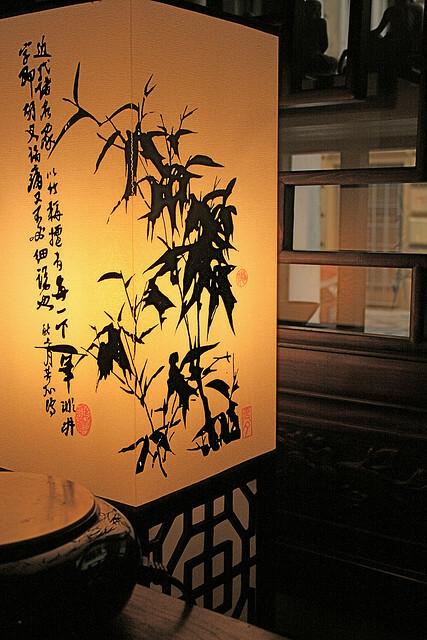 Chinese lamp that would prefectly compliment an orchid. There is endless depth in the tribe of orchid lovers. There are Feng shui practitioners, tattoo enthusiast, art masters, lovers and anyone who can appreciate the beauty of a flower. 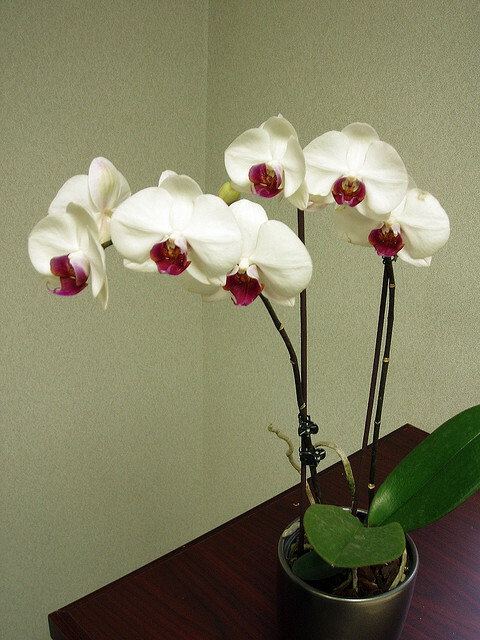 Don’t forget to show the orchid love in the office too! Six Wise said that “in Rehabilitation Literature, a manufacturing company integrated plants into its office so that no employee would be more than 45 feet from greenery. The result? Company administrators said they noticed enhanced creativity and increased productivity in employees.” That kind of evidence is awesome and I recommend enhancing your work environment. Beautiful bloom of 11 orchids on the edge of office desk. I used to think that the whole process of giving and receiving flowers was really outdated. I just was not a fan of putting my flowers in my amazing vase and then they die within four days. Orchids are the complete opposite of that. They can be a wonderful way to show someone that you not only love them, but that you care about them in a deep way. Orchids have a tendency to provide long term fulfillment. Orchids have evolved into one of the most popular house plants to own. Since orchids hit the mainstream, the world has become a much more beautiful place. Orchids are the latest, greatest trend happening in flowers because they are drop dead gorgeous, they are easy to grow almost anywhere and they have overcome stereotypes of being overly posh and expensive. As you can see, orchids are awe-inspiring. “No other plant family is as diverse as the orchid family or as colorful, and no other houseplants offer flowers that can remain in bloom for months,” said Wilella Stimmell, Orchid Society of Arizona member and 30-year orchid grower. There are more than 100,000 hybrids and 25,000 – 30,000 species of orchids alive today (Wilella Stimmell). For the most part, orchids have a very tarnished reputation. 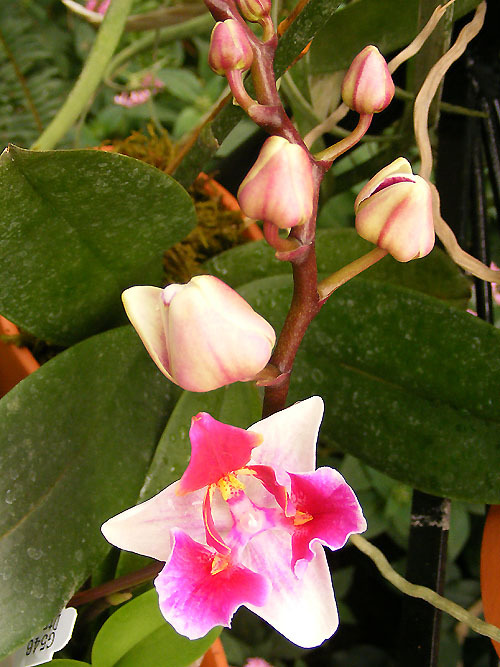 The history of orchids is responsible for the orchid’s reputation. According to the Tacoma Orchid Society, orchid collecting began in the Victorian Era. 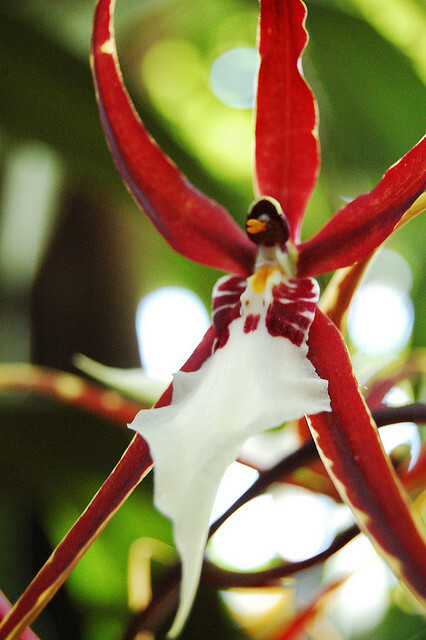 Wealthy settlers in Europe would hire explorers to go search the tropics to find the most unique and exuberant orchids that existed. When the orchids would return back to them on ship, most of the orchids withered away from the long travel. The wealthy Europeans “built glass houses heated with coal furnaces,” to serve as a modern day greenhouse to keep the plants alive. When they would witness an orchid in bloom, Europeans would cause frenzy and send the next crew of explorers out to collect more. The history of orchids definitely adds an extra flair to the orchid excitement. Since the Victorian Era, orchids have come a long way. People tend to think orchids are extremely pricey and that only people living in a luxury real estate magazine can afford them. Others believe that keeping a flower like the orchid alive would require endless, sleepless nights farming in a greenhouse lab. But the truth is you don’t have to visit a deserted tropical island to find one, you can just pick one up the next time you are at the grocery store. Common, everyday stores like Frys, Wal-Mart, IKEA or even Home Depot all carry orchids for $7 – $14. Despite having complicated names, the breeds Phalaenopsis (fal-eh-NOP-sis) or Paphiopedilum (paff-ee-oh-PED-ih-lum) are the easiest to keep alive and in bloom. I have a collection of this breed all throughout my home and office. Watering this plant is simple because most of the time all that is needed is three ice cubes. When watering becomes a habit, ice cubes begin to remind you of orchids, making it much easier to remember to water. 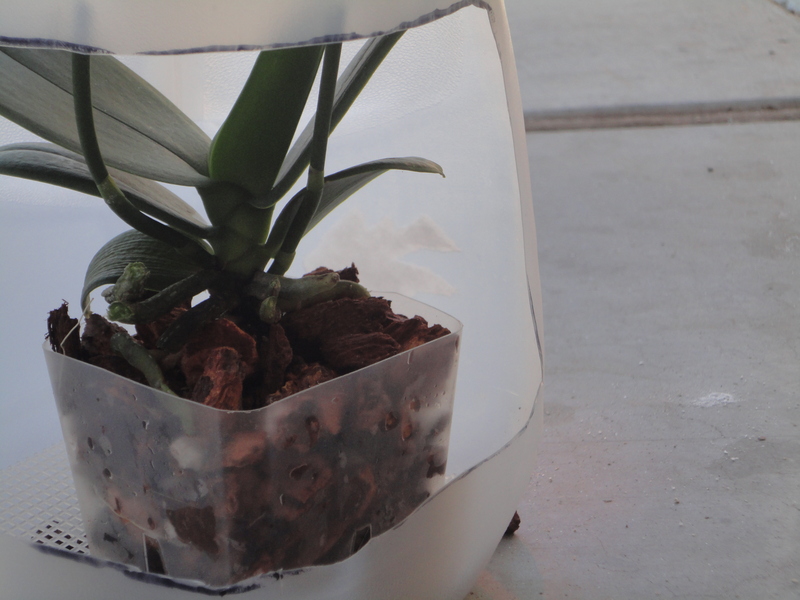 Besides three ice cubes, all the orchid needs is to be re-fertilized every couple of weeks, and that is it! The reasons to join the orchid phenomenon are never ending. If you haven’t changed your mind yet, I am going to leave you with a picture of the Phalaenopsis Brother Sara Gold to gasp at. Recent posts to check out!